Hello my lovelies, and Happy Christmas Eve! I'm sure you're all getting super excited! Today's guest post is from Kirsty over at FairyTales Nails. Me and Kirsty have become amazing friends through our love of nail polish so I had to ask her to post for me. She has the Uber Chic Christmas stamping plate to share with us, including some gorgeous swatches. Read on for more! Hello lovely people, I am so honored to be writing this guest post for my lovely friend Becca while she is away. Me and Becca are both completely mad about Christmas so I thought the best guest post to do for her would be a review on the fabulous Uber Chic Christmas plate. It is thanks to my good friend Becca that I even own this plate, she picked it up from me from the fantastic She Sells Seashells. This plate was £11 which I think is a fabulous price, it is great quality just what we have come to expect from Uber Chic. 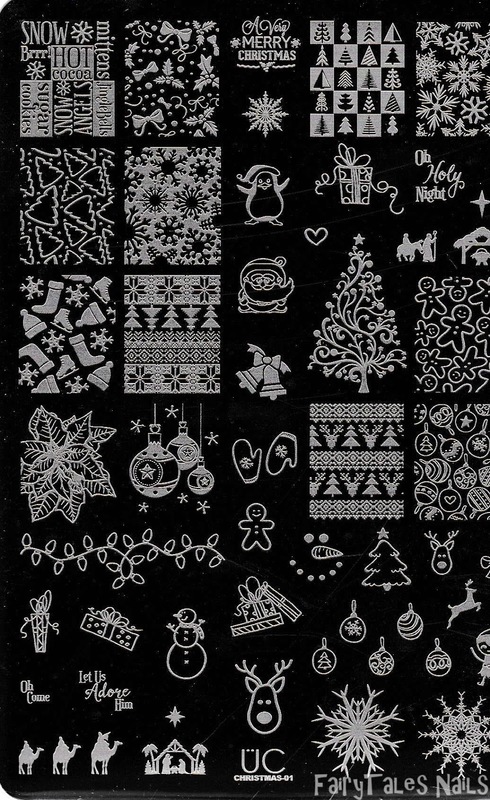 They gave us tons of unique and perfect images for this festive season, this plate is full of both full nail images and singular images. There is everything on here from Christmas penguins to a fat jolly Santa. 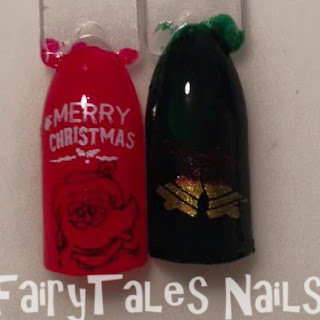 The full nail images are all perfect for giving you the best festive manicure you could possibly ask for in a matter of minutes. The nativity scene at the bottom of the plate would be perfect to go across all of your nails, it would look great at a child's school nativity play or even to wear to Christmas eve mass. Another good image to go across all of the nails are the Christmas tree lights they would look lovely flowing across all of your fingers. 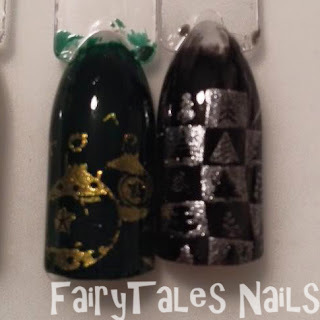 For my swatches I wanted to choose the most Christmassy designs I could find and even give some of you some inspiration for a manicure you could create yourself with this plate. The polishes that I used for my swatches are Barry M Black, China Glaze White on White, OPI Christmas Gone Plaid, OPI I Carol About You and OPI Cinnamon Sweet. All of these OPI's are from the Gwen Stefani Holiday collection from 2014, all of these are fantastic colours for Christmas. I am loving the jolly Santa clause Stamped over OPI Cinnamon Sweet and I think that the Merry Christmas stamped in white would make it a great accent nail. With the bells I was hoping that the red ribbon would show up a bit clearer over OPI's Christmas Gone Plaid, but the gold bells do look lovely stamped over the green. 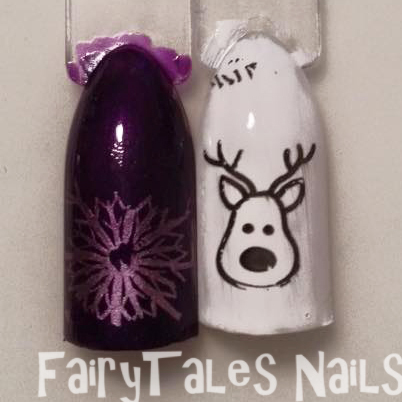 The next set of swatches I chose to stamp was this gorgeous purple snowflake, there are so many snowflake images to choose from but this one is so unique and intricate I couldn't resist. 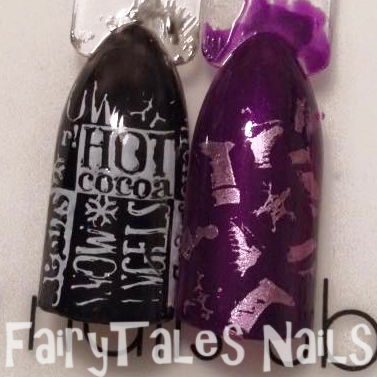 I used my Models Own purple chrome to stamp over OPI I Carol About You, I think this gives it such a delicate effect. Christmas wouldn't be Christmas without a reindeer and this lovely plate has two, one is bigger than the other so it would be able to fit any nail. Next I chose to stamp the ugly Christmas jumper design with the trees, this went perfectly over Cinnamon Sweet. 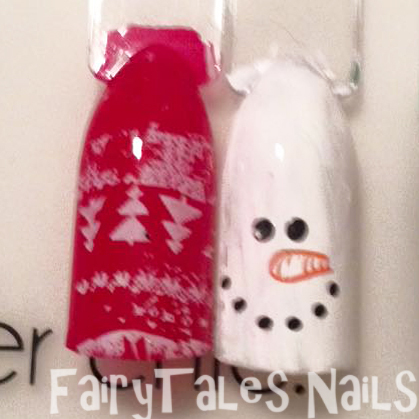 Then as another idea for an accent nail I stamped the snowman's face, I used my Sally Hansen Insta-dri Pumpkin Queen for his carrot nose and then just stamped his mouth and eyes with black stamping polish. I was trying to create a sort of Christmas tree effect by stamping the hanging baubles over Christmas Gone Plaid, I do wish the gold would have looked a bit more crisp but I love the detail that is added to these baubles. 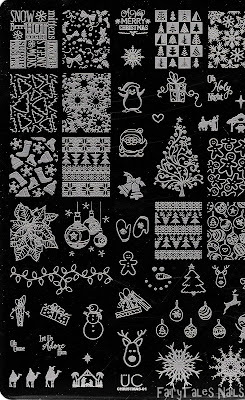 Then for a wrapping paper effect I stamped the Christmas tree design over black in a silver stamping polish. My last two swatches were of the image in the top left hand corner, this is a gorgeous image full of all the words that would be associated with this time of year. This image also reminds me of wrapping paper, I actually brought some quite similar to this recently to wrap my boyfriends presents. For my last swatch I again used my Models Own purple chrome polish, I thought it looked lovely with the skates and boots design. Overall I am loving this plate, it has everything you could wish for and more. 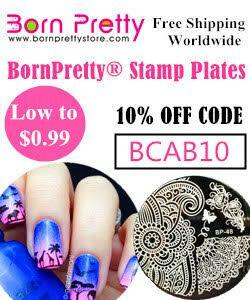 All of these Christmas designs will be great year after year, that's what I love about stamping plates they will last you forever as long as you take care of them. I hope you have enjoyed this post and I have done Becca some justice, I highly suggest picking up this plate before it sells out. It is definitely a must for any stamping collection. I want to say a massive thank you to Kirsty for sharing this amazing plate with us. How adorable are those designs?! I didn't pick this plate up for myself but it's definitely on my wishlist for next year! If you haven't yet, check out Kirsty's blog here and Instagram here.